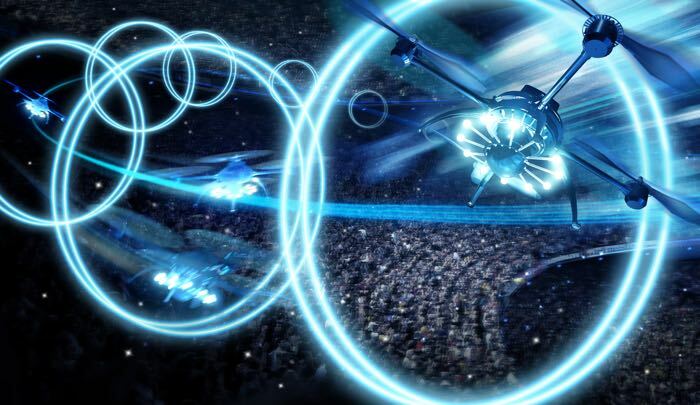 Drones are becoming more and more popular and now the world’s first 3D drones entertainment show has been announced, it is called AIR and it will take place at the Amsterdam Arena later this year. The show will be made up of drones and live 3D effects, the video below gives us a preview of what this 3D drone show will be like. “Never before has it been possible to create a show like this. Innovation, art and entertainment connected together perfectly. In our opinion, the AIR entertainment experience is the next phase of innovation, and we cannot wait to bring the world’s sensational premier of AIR to Amsterdam. Drone purchases and users are taking the world by storm by the millions, and because of new technology we are able to think in a very fresh and new creative way. AIR presents extraordinary capabilities and spectacular uses of drones to both Drone fanatics and the general public, to show produce another world of high-end entertainment brought to you where the Drones are the stars. “Said Klaas Rohde of Fjuze, initiator of this new project. You can find out more details about the AIR drones show at the link below, it will take place later in the year.